What could be prettier than a trio of bodacious white flowers to brighten up the dark days of winter? I ended up with several bulbs of Amaryllis ‘Apple Blossom’ after they’d summered on my patio. 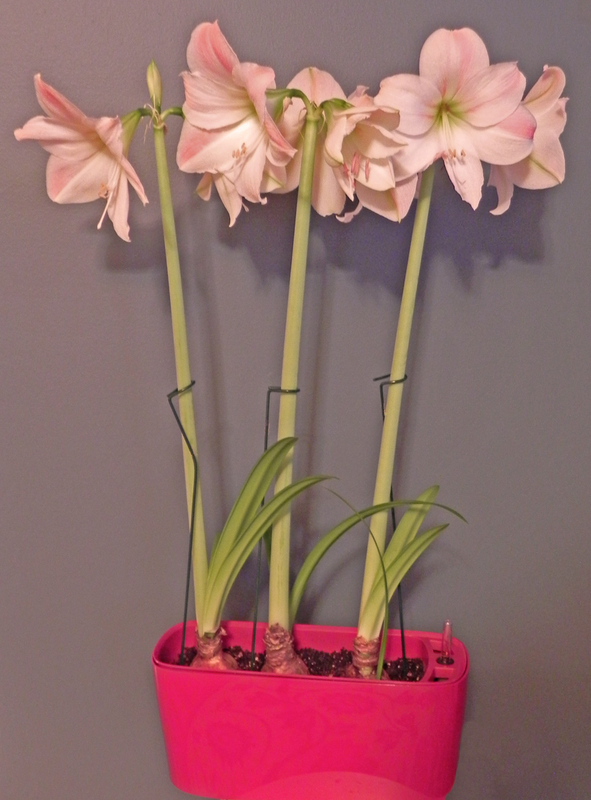 The largest three found homes in a Lechuza Delta 20 planter, made especially for plants that need excellent drainage. This two-part system features a pot in a pot—the outer layer filled with aggregate that keeps excess moisture from the soil in the inner pot. The inner section has legs that serve to elevate the root mass and keep it from sitting in excess moisture. 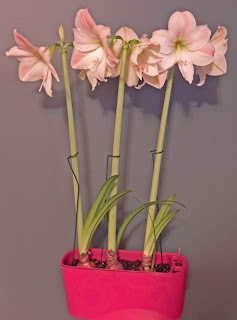 Amaryllis prefer a tight fit, which is why I put three bulbs in this planter, making sure to keep their “necks” above the soil level. I created a mix that included Jolly Gardener Premium Potting Mix and a specially-blended cactus/succulent mix from Ted's Greenhouse in Tinley Park, IL. The ratio of the two was about 12 parts potting mix with 1 part cactus/succulent mix. 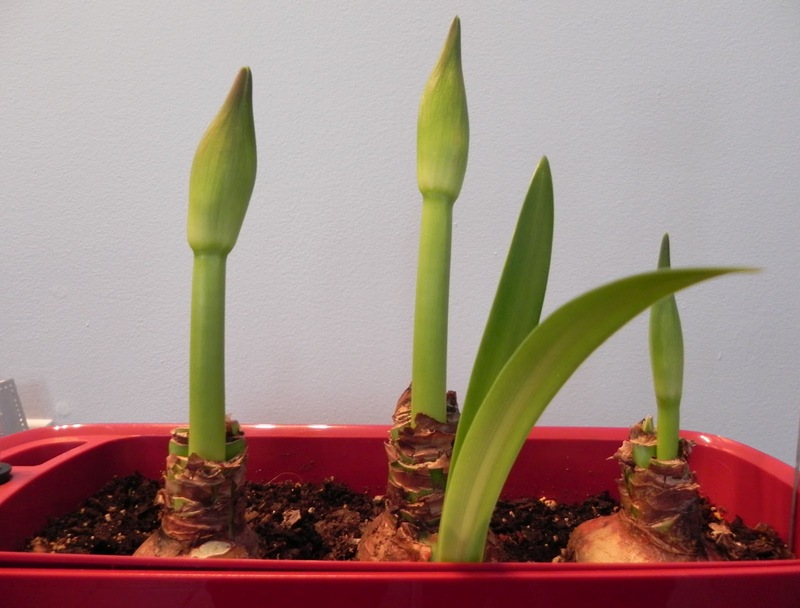 I gave the bulbs a good watering before slipping the inner pot into the outer section, took it inside and just ignored it. 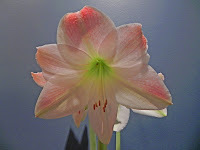 Instructions for re-blooming Amaryllis recommend a resting period of about six weeks during which time they should be kept cool and dry—around 55 degrees F.
I gave them no more water, and the temperature in the spot where I kept them eventually became cooler (around 60 degrees F.) as the weather outside cooled off around mid-November. Sprouts began to emerge about 13 weeks later. I gave it a good soaking with a dilute water soluble solution of plant food, and put the pot on a heated seed mat in a south facing window. Six weeks after the sprouts appeared, and 19 weeks after repotting the bulbs, all three bulbs were blooming. The arrangement of the flower matters so considerably for men and women regularly buy flowers. If you won a online florist, you’d recognize that 1 client would pick diverse flower arrangements ever so often.